Omaha, NE — The stories we tell and the clothes we wear are the subject of the latest show at the Omaha Playhouse. 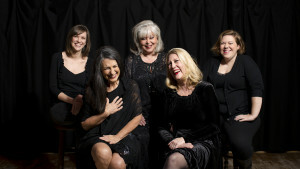 Back row L-R: Teri Fender, Charleen Willoughby and Caitlin Mabon. Front Row L-R: Judy Radcliff and Sonia Keffer. Now running through February 14th, Love, Loss, and What I Wore by Nora and Delia Ephron is a collection of stories from several women retelling their lives’ struggles and celebrations with the common thread of the outfits they wore for each occasion. The play is a readers’ theatre piece adapted from the book by Ilene Beckerman, whose character serves as the narrator for the stage show. Director Amy Lane said that Nora Ephron had a great fondness for the original work. Nora and Delia Ephron, each established writers in their own right, opened Beckerman’s story up for their theatrical adaptation. They interviewed 100s of women over the course of several months and put together a compilation of the women’s stories performed by the cast. Lane spoke about the Ephron sisters’ decision to make the play a readers’ theatre experience. The cast members sit down with scripts on music stands and deliver each character’s speech. While the speeches are monologues in the purest sense of the term, Lane said they feel much more like diary entries, like the character has invited you into their house and is telling you stories over a glass of wine. Lane said that while the play is by women and for women, the stories they tell and the experience they relate are something everyone can connect to or learn from. The Omaha Community Playhouse’s production of Love, Loss, and What I Wore runs now through February 14th on the Hawks Mainstage. For more information about the show, visit www.OmahaPlayhouse.com.